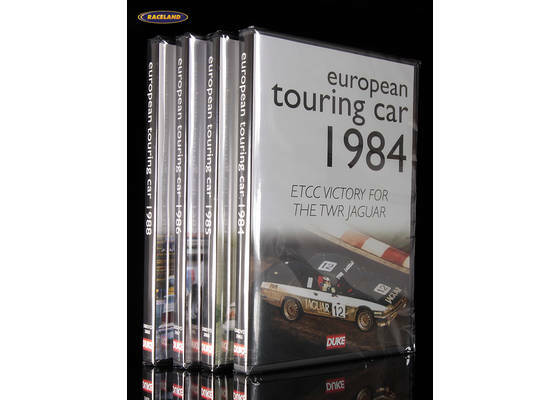 The product "DVD Collection European Touring Car Championship 1984-1988 with 4 discs" was successfully added to your wishlist. Four fantastic years of big-capacity tin-top action. As BMW, Jaguar, Volvo, Alfa, Toyota and Ford threw serious money at trying to put together winning cars to be driven by the likes of Gianfranco Brancatelli, Winfried Vogt, Roberto Ravaglia, Tom Walkinshaw and Johnny Cecotto the ETCC had a final flourishing of world-class competition before its premature implosion. Thankfully the film cameras were on hand to capture the sensational action and we can now sit back and watch in awe as brave men race Volvo 240s, BMW 635 CSis and Jaguar XJRs right on the limit, and often in terrible conditions. It's great!Running time 337 minutes in total, PAL 4:3 Aspect, Mono, Code 0 all regions, English language.